Welcome to Beet Life! Thanks for stopping by! Beet Life is about living a plant-based, active, healthy and mindful lifestyle. We believe eating whole foods is an opportunity to nourish our bodies and connect with others. 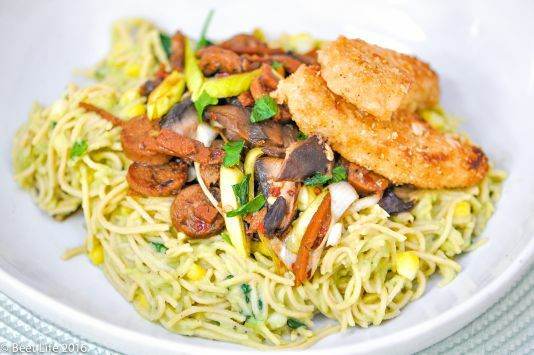 Our blog features easy-to-follow vegan recipes we make and eat ourselves. We share these recipes in hopes that you can enjoy them and maybe even modify our ingredients and methods to suit your own needs. We also feature articles that our team members have individual interests in. We hope to see you here often and don’t forget to follow us on Instagram, Twitter, Facebook, Pinterest and GitHub. Share your creations and passions using #ourbeetlife or email us at ..<click me>..@beet.life. Stay tuned for new recipes and updates! This summer we are participating in the Appalachian Mountain Club (AMC) Summer Hiking Series. It’s essentially a bunch of people coming together who are interested in hiking NH 4000 foot peaks. The series include 4 guided hikes designed to help us get into good hiking condition. The first (warm up) hike was at the Blue Hills Reservation in Milton, MA. We hiked around 6.13 miles– Skyline Loop (Eliot Tower- Park Headquarters) then Buck Hill through Tucker Hill and back. 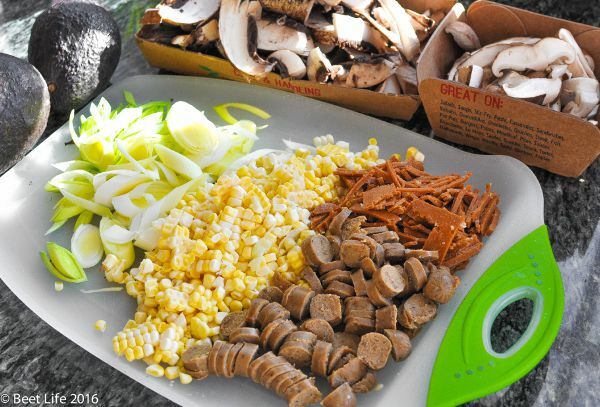 Nutrition is very important when hiking. I burned 2,231 calories hiking at Blue Hills! A person generally burns from 400 to 600 calories per hour when hiking. That’s a lot of energy coming out that needs to be replenished! 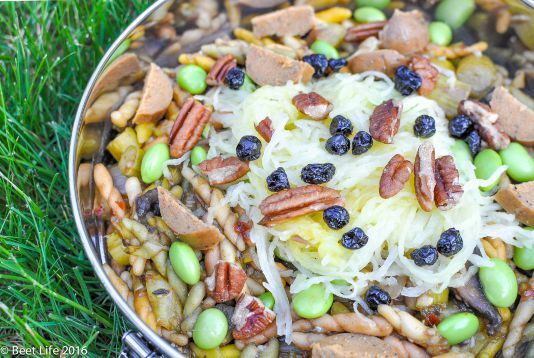 This dish is designed specifically as a trail lunch so it has plenty of protein, calories, good fats, carbs and nutrients to keep you feeling good and energized! I made it the night before and stored it in Life Without Plastics Stainless Steel Airtight Watertight Food Storage. This meal can be eaten cold, warm or hot. Kare Kare is a traditional filipino dish comprised of meat and vegetables stewed in a creamy peanut sauce. 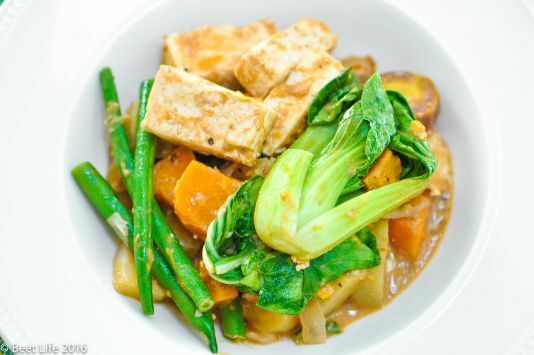 This plant-based version replaces meat with extra firm tofu. My grandma usually puts chayote in the dish. Chayote is a lime-colored squash shaped like a pear. It is high in potassium and low in sodium which is good for maintaining a healthy blood pressure. It is also rich in vitamin C, B-6 and folate. You can use summer squash as a substitute if you can’t find chayote in the grocery stores near you. 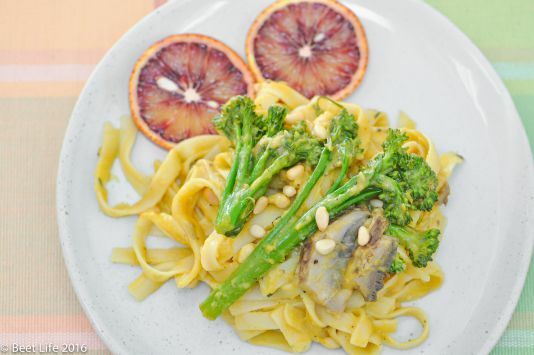 The combination of peanut butter and the aromatic licorice flavor from the star anise gives this dish a simple, but distinct flavor. The peanut butter sauce is made of water (or vegetable broth), Bragg’s Liquid Aminos (or soy sauce), creamy peanut butter, ground black pepper and star anise. That’s it! It’s very easy to make and takes around 20 minutes to cook after preparing all the vegetables! Each serving has 10.3 g of monounsaturated fat from the peanut butter and olive oil. Monunsaturated fat helps reduce bad cholesterol levels, lowering risks of heart disease and stroke. Giniling Guisado is ground pork marinated in soy sauce and calamansi juice (lemon/lime) that is typically sauteed with tomatoes, potatoes, carrots and bell peppers. This was one of the Filipino dishes I missed the most when we became vegan. I loved the texture and tanginess of the dish combined with white rice! 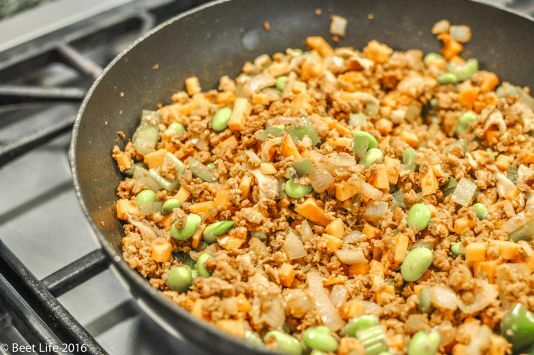 Giniling is the Filipino version of Picadillo, a Spanish and Latin American ground beef hash. Picadillo is usually made with raisins, diced potatoes and tomato sauce. I discovered Gardein Beefless Ground a few months ago and that was all I needed to start making Giniling again! I made other changes to the traditional recipe. I did not use tomatoes, and doubled up on the lime. Instead of soy sauce, I used Bragg’s Liquid Aminos. I also used sweet potatoes instead of potatoes, and added shiitake mushrooms for a meaty texture. 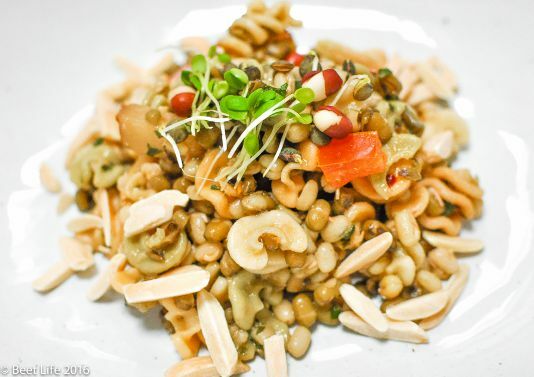 Farro is an ancient nutty-tasting wheat grain that originated in Egypt. It’s a great substitute for pasta. It has lots of protein, high concentration of dietary fiber and is a resistant starch. Farro’s complex carbohydrates break down slowly. This keeps energy and sugar levels stable, and helps us feel full longer. 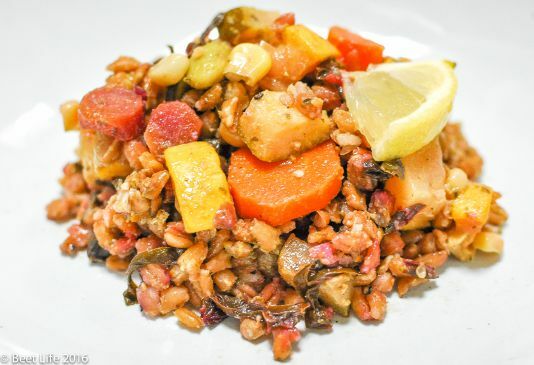 Farro also helps improve metabolism because it is rich in vitamin B3. We like incorporating farro into our post-workout meals because it provides magnesium, iron and zinc. Magnesium is an electrolyte which supports muscle, nerve and brain function. It relieves muscle cramps, PMS symptoms, and headaches. Iron allows red blood cells to carry oxygen to our tissues, making us feel energized. Zinc stimulates white blood cell function in our bodies. This helps defend against infections and repair our bodies. Not bad for someting so yummy! Happy Cooking! Mung bean is a resistant starch. Resistant starch is a kind of dietary fiber that resists digestion. It passes through the upper digestive tract undigested and feeds good gut bacteria in the large intestine and colon. Good gut bacteria produce a fatty acid called butyrate which reduces inflammation and helps fight metabolic and physical stress. This lowers our risk for colorectal cancer and prevents inflammatory bowel diseases like ulcerative colitis, constipation, diarrhea, and diverticulitis. Studies suggest that resistant starches stimulate good gut bacteria growth particularly when served cold/cool so this dish is meant to be served as a cold salad. This has 16.6g of protein, 0mg of cholesterol and 765.5mg of potassium! I love eggplants because they’re so versatile. 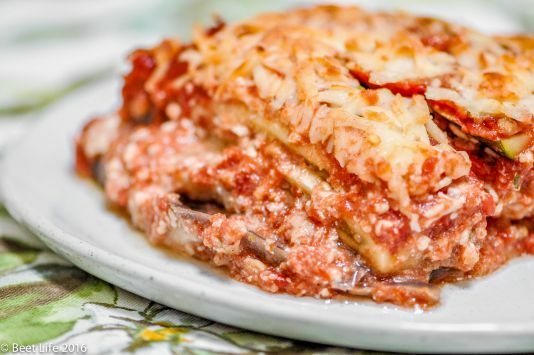 Of all the eggplant dishes, eggplant parm is without question my favorite! There’s just something so satisfying with how the eggplant, tomato sauce and cheese melt in my mouth. I wasn’t sure how we could make this eggplant parm casserole without eggs until I tried mixing vital wheat gluten with flax milk. The batter is close in texture to the traditional egg-and-flour batter. As a cheese substitute, I used Trader Joe’s Vegan Almond Cheese Mozzarella Style Shreds. I couldn’t tell the difference! 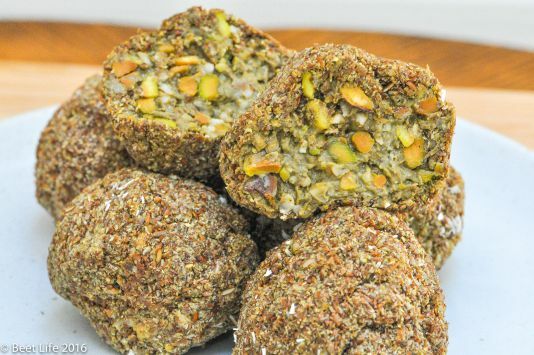 We love making protein bites because they are so easy to make. No baking needed! 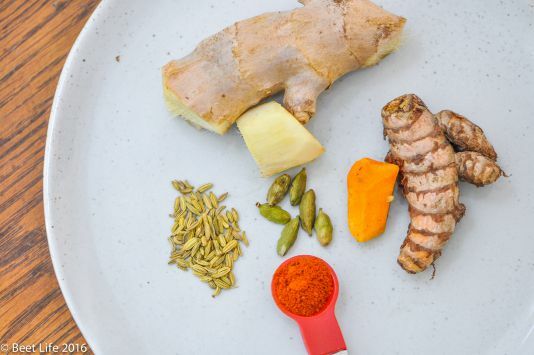 The ingredients in this recipe are heart-healthy and great for weight management! Each bite contains matcha, steel cut oats, flaxseed meal and pistachios. Matcha is green tea powder or ground up young leaves from the camellia sinensis (tea) plant. It boosts metabolism and energy, detoxifies the body and calms the mind. Steel cut oats are low in glycemic index which prolongs the feeling of fullness. It also contains soluble fiber which helps lower blood pressure and LDL (bad cholesterol) levels. One of the things we missed the most when we went vegan was the rich and creamy taste of fettuccine alfredo. The traditional recipe calls for butter, heavy cream and parmesan cheese, but in our healthy vegan version, we used coconut cream, olive oil and pumpkin puree. Coconut cream is a great substitute for heavy cream. It contains less water than coconut milk so it has a richer and thicker texture (great for cooking sauces). It’s a good source of B vitamins which help the body convert eaten food into useable energy (glucose). Coconut water is rich in potassium. Potassium helps regulate fluids and minerals, controls muscle and heart activity, and hydrates the body. Coconut water helps flush out respiratory secretions, and replace fluid loss from the gastrointestinal tract. Hydration is very important when we’re sick because lack of water leads to worsening of nausea and vomiting. © 2016 Beet Life. All rights reserved.